Combination of three color images of NGC 7023 from SOFIA (red & green) and Spitzer (blue) show different populations of PAH molecules. Credits: NASA/DLR/SOFIA/B. Croiset, Leiden Observatory, and O. Berné, CNRS; NASA/JPL-Caltech/Spitzer. Bavo Croiset of Leiden University in the Netherlands and his collaborators focused on a type of molecule called polycyclic aromatic hydrocarbons (PAHs), which are flat molecules consisting of carbon atoms arranged in a honeycomb pattern, surrounded by hydrogen. PAHs make up about 10 percent of the carbon in the universe, and are found on the Earth where they are released upon the burning of organic material such as meat, sugarcane, wood etc. Croiset’s team determined that when PAHs in the nebula NGC 7023, also known as the Iris Nebula, are hit by ultraviolet radiation from the nebula’s central star, they evolve into larger, more complex molecules. Scientists hypothesize that the growth of complex organic molecules like PAHs is one of the steps leading to the emergence of life. Some existing models predicted that the radiation from a newborn, nearby massive star would tend to break down large organic molecules into smaller ones, rather than build them up. To test these models, researchers wanted to estimate the size of the molecules at various locations relative to the central star. 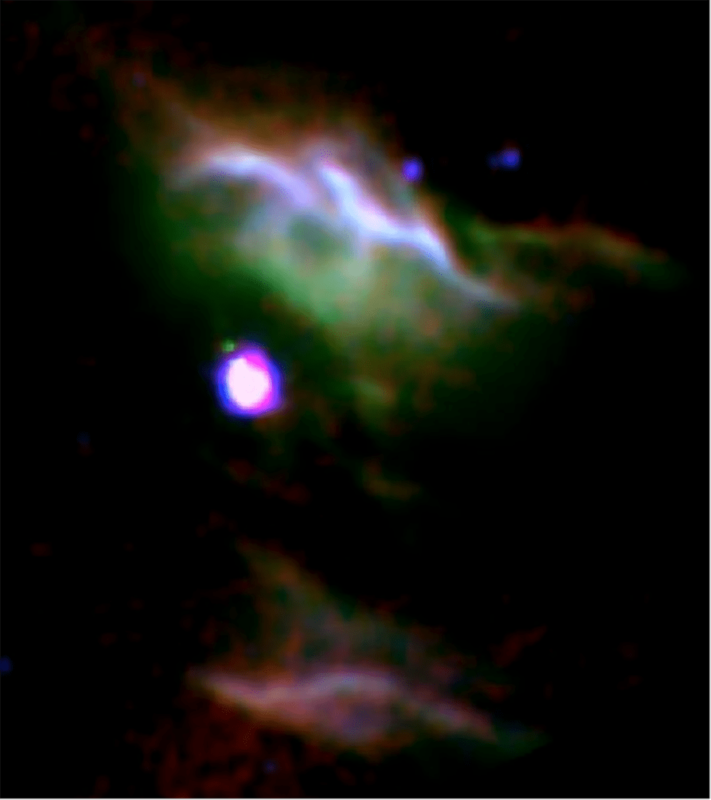 Croiset’s team used SOFIA to observe Nebula NGC 7023 with two instruments, the FLITECAM near-infrared camera and the FORCAST mid-infrared camera. SOFIA’s instruments are sensitive to two wavelengths that are produced by these particular molecules, which can be used to estimate their size. The team analyzed the SOFIA images in combination with data previously obtained by the Spitzer infrared space observatory, the Hubble Space Telescope and the Canada-France-Hawaii Telescope on the Big Island of Hawaii. The analysis indicates that the size of the PAH molecules in this nebula vary by location in a clear pattern. The average size of the molecules in the nebula’s central cavity, surrounding the illuminating star, is larger than on the surface of the cloud at the outer edge of the cavity. In a paper published in Astronomy and Astrophysics, The team concluded that this molecular size variation is due both to some of the smallest molecules being destroyed by the harsh ultraviolet radiation field of the star, and to medium-sized molecules being irradiated so they combine into larger molecules. Researchers were surprised to find that the radiation resulted in net growth, rather than destruction. “The success of these observations depended on both SOFIA’s ability to observe wavelengths inaccessible from the ground, and the large size of its telescope, which provided a more detailed map than would have been possible with smaller telescopes,” said Olivier Berné at CNRS, the National Center for Scientific Research in Toulouse, France, one of the published paper’s co-authors.